Gulin Qingmao was said to have been the leading Zen figure during the Yuan dynasty. 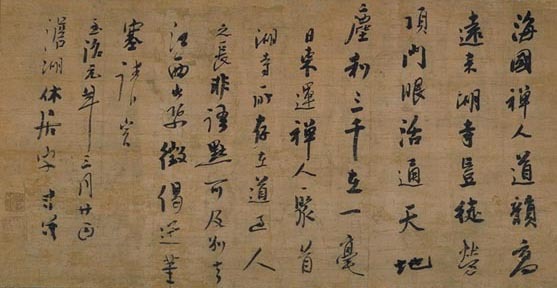 The subject of his calligraphy was exclusively educational; about the essence of Zen, and not mere compliments. His powerful calligraphic style is much admired and he is considered to be the most distinguished Zen calligrapher. This is a farewell gift for Ten’nen Kō-un, a Buddhist student from Japan and it extols his talents. Gulin Qingmo wrote it when he was sixty years old, probably at the request of Kō-un.